Helaine Ettinger is studying towards an Executive Masters program in Jewish Education. She is a 1991 ordinee of the Hebrew Union College-Jewish Institute of Religion. She lived for nearly five years in Kfar Saba, Israel and was an active member of the Masorti congregation, Hodv’Hadar. While in Israel she taught in the Masorti movement’s Bar and Bat Mitzvah for the Special Child program. Since returning to the United States in 2001 she has been Synagogue Outreach Coordinator for the MetroWest Jewish Health and Healing Center (2001-2003); a Board member of the Solomon Schechter Day School of Essex and Union; and a teacher in the Florence Melton Adult Mini School. She has served two congregations, the Jewish Congregation of Kinnelon for 13 years and Congregation B’nai Harim for 3 years. 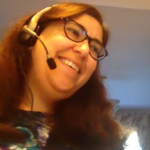 Within the Reform rabbinate she has been active in the Women’s Rabbinic Network and served as Co-President 2012-2014. She is married to Henry Bloom and the mother of Lyla, Yael, and Shai Bloom.